Citation: Alabdulgader AA. Survival analysis: Prenatal vs. postnatal diagnosis of HLHS. J Invasive Noninvasive Cardiol. 2018;1(2):8-12. Introduction: Diagnosis of congenital heart diseases including Hypoplastic Left Heart Syndrome (HLHS) in prenatal becomes a routine practice. It allows better preoperative management and offer opportunity to parents and physicians to intervene earlier. We described differences in survival outcome for patients diagnosed prenatally or postnatally with HLHS in and who had surgical intervention study area. Methods: Survival analysis using Kaplan-Meier product limit method was performed to estimated probability of survival for 88 patients diagnosed with HLHS and surgical intervention. The primary outcome measures were 12 months survival after birth and after surgical intervention. Results: Overall one year survival for HLHS patients was 63%. There was difference in survival between the two study groups (65% vs. 60%) for postnatal and prenatal diagnosis of HLHS respectively. This difference was not statistically significant (P=0.4). On the other hand, there was variation in survival according to intervention (80% vs. 0%) for patient who underwent surgery and those who declined surgery correspondingly. The difference was statistically significant (P<0.0001). However, there was no statistically significant difference in survival between prenatal and postnatal diagnosis of HLHS after surgery (67% vs. 63%; P=0.7%) respectively. Conclusion: In this study surgical intervention increases survival for patients diagnosed with HLHS, but there was significant difference in survival between prenatal or postnatal diagnosis of HLHS. Further studies of large sample size are prerequisite to investigate survival outcomes in Hypoplastic Left Heart Syndrome. Survival, Hypoplastic, Left, Heart, Syndrome, Diagnosis. Hypoplastic Left Heart Syndrome (HLHS) is characterized by a diminutive left ventricle incapable of supporting the systemic circulation. HLHS incidence rate up to 3 percent of all congenital heart disease, with a prevalence rate of two to three cases per 10,000 live births [1,2]. HLHS is the most common form of functional single ventricle heart disease . Several population-based and clinical studies observed male predominance in occurrence of HLLS [4,5]. There is underestimation in incidence rate most likely due to spontaneous abortions and elective termination of pregnancy of affected foetuses. Advances in surgical and medical interventions have improved outcomes of this condition. However, mortality remains high and survival rate after surgical repair still controversial in several report from numerous studies. Echocardiographic imaging remains the gold standard method for diagnosis of HLHS, whether preor postnatal [5-9]. In the meantime, the question of whether prenatal diagnosis of HLHS affects the postnatal outcome is controversial. However, reduction in acidosis, improved survival, long-term benefits and cost-effectiveness were reported . Hypoplastic Left Heart Syndrome reveals spectrum of structural cardiac malformations characterized by severe under development of the structures in left heartaorta complex. Its incidence varies from 0.1 - 0.25/1000 live birth. Accordingly, HLHS constitutes the highest cardiograph detection rate (2/3). Easiness of fetal diagnosis of Hypoplastic Left Heart Syndrome usually correlates positively with its severity i.e. the more easily diagnosed Hypoplastic Left Heart Syndrome in one group of patients the higher severe characteristics of that group, hence the lower chance of its survival. Detection during first months of pregnancy may represent an indication for termination . Prenatal recognition of HLHS provides an opportunity to plan post natal management in terms of optimizing the condition of affected baby to undergo surgical intervention. Moreover, with the introduction of Norwood (NW) three-step reconstructive operation as well as heart transplantation in neonates improved prognosis of HLHS was highly ensured . However, long -term comparative survival outcome studies from the two procedures are scant. As HLHS survival and functional outcomes from NW operations are highly questionable, firm recommendation about its validity is needed. NW1 carries the highest surgical risk (operative survival 46-76%), in contrast NWII and NWIII which have much lower (5%) mortality [13-15]. The aim of this study was to describe differences in survival outcome for patients diagnosed prenatally or postnatally with HLHS in and who had surgical intervention in tertiary referral centers for pediatric cardiology and cardiac surgery in study area. A retrospective comparative analytical study of patients diagnosed with HLHS prenatal and postnatal conducted. HLHS diagnosis was performed using data from pediatric cardiology and cardiac surgery centers in Eastern Region of Saudi Arabia. Echocardiography was done to diagnose HLHS of foetus prenatal and infants postnatal. Eighty eight patients were identified of whom, 43 newborns diagnosed prenatally with Hypoplastic Left Heart Syndrome (HLHS) in (37-42 weeks) and confirmed postnatal and 45 newborns diagnosed postnatally with HLHS in the first 4 weeks of life. Main outcome measure was survival till 12 months after Norwood surgical procedure. Survival probability was estimated for patients with HLHS diagnosis and surgical intervention by using survival analysis was performed according to the Kaplan-Meier product limit method. The primary outcome measures were 12 months survival after birth and after surgical intervention. Estimated survival probability and their 95% Confidence Intervals (CIs) were reported. Log rank was used to determine whether the survival probabilities were significantly different with HLHS diagnosis and among those who underwent surgical interventions. Log rank test (Mental–Cox and Breslow) were performed. All statistical analyses were performed by using SPSS (Version 20.0; IBM® SPSS Statistics). Total number of patients who were included in the study (n=88) out of them 43 (49%) and 45 (51%) were diagnosed in prenatal time and postnatal period respectively. There was no variation in the proportion between the two study groups. Among prenatally diagnosed fetus with HLHS none of the parents had chosen to terminate the pregnancy, thus all the 43 were born alive. Overall, 71 patients in the study who underwent surgery was of them 35(49%) from prenatal group and 46 (51%) from postnatal group. There was statistically significant difference in the overall proportion of those who underwent surgery and those who did not (81% vs.19%; P<0.0001). Moreover, there was statistically significant difference between the two group in selection of surgery (100% vs. 79 %; P=0.0004), for prenatally and postnatally diagnosed patients respectively. Among 34 fetus who were prenatally diagnosed with HLHS, 43 (81%) after birth underwent surgery while in the postnatal group 36 (80%) underwent surgery. There was statistically significant difference in proportion of patients whose parents selected surgery and those who declined the treatment in both group (P<0.0001). However, there was no statistically significant difference in proportion of patients whose parents declined the surgery (20% vs. 19%; P= 0.8) for prenatal and postnatal respectively (Table 1). Table 1: Surgery intervention in prenatal and postnatal patients diagnosed with HLHS. Fellow for both diagnosis groups for 12 months was conducted and survival analysis was performed to assess the impact of diagnosis on outcome. Overall mean survival time for both groups was 11 months. There was no statistically significant difference in mean survival time between the two groups (11.2 vs. 11.0) for prenatal and postnatal HLHS diagnosis respectively. Although the postnatal diagnosed patients has high freedom of survival than prenatally diagnosed patients (65% versus 60%) for prenatal and postnatal respectively. There was no significant different in survival between the two groups (P=0.4) Figure 1. 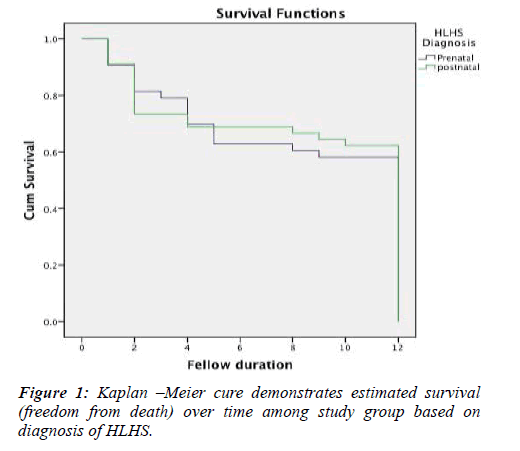 Figure 1: Kaplan –Meier cure demonstrates estimated survival (freedom from death) over time among study group based on diagnosis of HLHS. Follow-up for survival for both groups was conducted parallely to all patients who underwent and relinquished surgery in both groups for a period of 12 months. Overall survival was 56 (80% versus 0%) for surgery and no surgery respectively. There was statistically significance difference (P<0.0001) Figure 2. The finding revealed that prenatal has better survival that postnatal (67% vs. 63%) respectively, but there was no statistically significant difference in survival between prenatal and postnatal diagnosis of HLHS after surgery (P=0.7%) Figure 3. 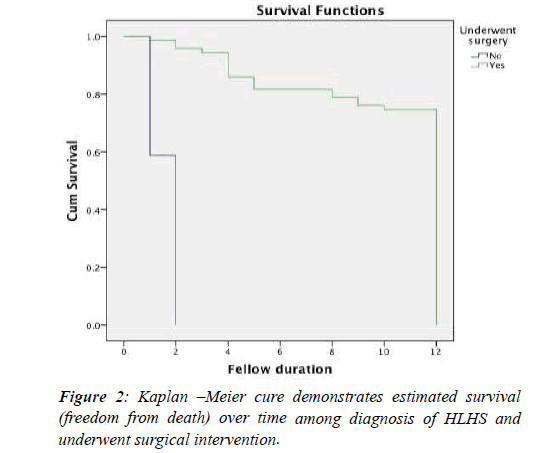 Figure 2: Kaplan –Meier cure demonstrates estimated survival (freedom from death) over time among diagnosis of HLHS and underwent surgical intervention. 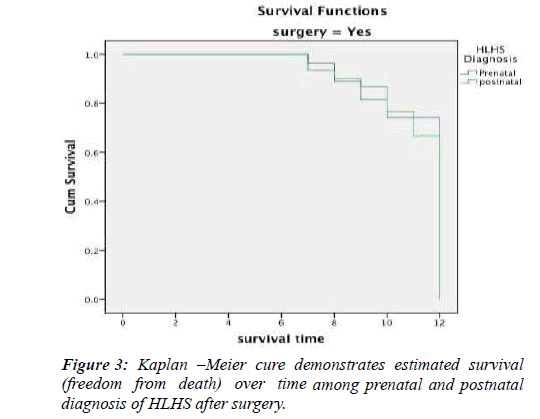 Figure 3: Kaplan –Meier cure demonstrates estimated survival (freedom from death) over time among prenatal and postnatal diagnosis of HLHS after surgery. Incidence of HLHS occurs up to 3 % of all congenital heart disease, with a prevalence rate of two to three cases per 10,000 live births [1,2]. HLHS is the most common form of functional single ventricle heart disease . A male predominance, with a ratio approximately 1.5:1 male to female respectively, as was observed in most population-based and clinical studies [16,17]. The reported overall incidence is likely underestimated because of the indeterminate rate of spontaneous abortions and elective termination of pregnancy of affected fetuses. Although, its low incidence relative to other congenital cardiac disorders, HLHS, if left untreated, is responsible for about 25% to 40% of all neonatal cardiac deaths . This evidence supports our study findings in which the overall death was 24% among patients whose parents declined surgery. Infants with HLHS are more likely to be born prematurely or at low birth weight than infants without HLHS . Fetuses with HLHS have decreased growth velocity in late pregnancy compared with unaffected fetuses, resulting in small for gestational age presentation . In spite of substantial improvement in surgical survival and advances in intensive medicine, patients with HLHS remain at risk many problems postoperative that jeopardize their survival [21-24]. Diagnosis of HLHS in prenatal has remarkable benefits. It permits amble time to parents to have sufficient counsel as well as it allows time for both parents and physicians caring to plan perinatal management. In several healthcare facilities patients diagnosed prenatally were found to have a more stable preoperative course [25,26]. These findings were line with our study results as consequence prenatal diagnosis of HLHS and proper perinatal care, the termination rate in our study was 0% for prenatally diagnosed fetus with HLHS, which was highly significantly low compared to other studies. Silverman et al. reported termination rate of 33%, Whittle et al. showed termination rate of 25%, and Degenhardt et al. , reported termination rate of 16.1%. The difference in between our study rate and other studies rate is definitely due variation in practice, which is virtually influenced by culture and law and religion. Surprisingly, all prenatal diagnosed fetuses were born live and there was no miscarriage due to excellent antenatal care service which was provided free of charge for all population. Higher surgical survival in babies diagnosed prenatally compared to postnatal diagnosed were reported . This finding contrast to our study findings where postnatal diagnosed patients have higher survival rate. On the other hand, postnatal survival was similar for both prenatal and postnatal diagnosed groups. Cooper et al. reported that postnatal survival was similar for the fetal and infant series 77% vs. 85% where statistically significant difference was not noticed as regard for the impact of prenatal diagnosis. The findings matched our study findings. Silverman et al. , reported survival overall rate 75%, and for prenatal HLHS 100% and 66% for postnatal. In our study findings revealed overall survival rate of 79% which is higher than that reported by Silverman and his colleagues, but he reported maximum survival prenatal rate 100% which was higher compared to what our stay finding 74%. Regarding postnatal survival rate, our study revealed higher rate 81% than the reported rate by Leval et al. , 57% , Jonas et al. , 64%; 51%; and Atallah et al. , 71% respectively. In another study by Shekerdemian et al. in Australia, they found that the survival to intensive care discharge and stage 2 palliations was 74% and 68% respectively, and was not influenced by timing of diagnosis. In another study by Degenhardt et al. stated that the survival rate was 40.9 % after prenatal diagnosis and there was an 81.1 % survival rate in infants undergoing surgery and a 64.1 % survival rate from an intention-to-treat position. However, Noon-Grady  and his colleagues reported high rates and they found no difference in survival rate after surgery between the prenatal and post postal diagnosed patients (91% versus 89%).They concluded that in their recent experience has shown that prenatal diagnosis of HLHS was not associated with a survival advantage. This conclusion matched our study findings. This is the first study in the region to compare survival outcome prenatal and postnatal diagnosed hypoplastic left heart syndrome. The study findings showed that there was statistically significant difference in proportion of patients who underwent surgery and didn’t, in both pre and postnatal diagnosed patients with HLHS. However, the findings revealed no statistically significant difference in survival outcome between prenatal and postal diagnosed patients. On the one hand these findings were convergent with some studies; on the other hand they divergent of several studies. Further study with big sample size is needed to confirm the generated evidence by this study. Gordon BM, Rodriguez S, Lee M, et al. Decreasing number of deaths of infants with hypoplastic left heart syndrome. J Pediatr. 2008;153(3):354-8. Reller MD, Strickland MJ, Riehle-Colarusso T, et al. Prevalence of congenital heart defects in metropolitan Atlanta. J Pediatr. 2008;153(6):807-13. Fixler DE, Nembhard WN, Salemi JL, et al. Mortality in first 5 years in infants with functional single ventricle born in Texas. 2010;121(5):644-50..
Karamlou T, Diggs BS, Ungerleider RM, et al. Evolution of treatment options and outcomes for hypoplastic left heart syndrome over an 18-year period. J Thorac Cardiovasc Surg. 2010;139(1):119. Ohye RG, Sleeper LA, Mahony L, et al. Comparison of shunt types in the Norwood procedure for single-ventricle lesions. N Engl J Med. 2010;362(21):1980. Stasik CN, Gelehrter S, Goldberg CS, et al. Current outcomes and risk factors for the Norwood procedure. J Thorac Cardiovasc Surg. 2006;131(2):412. Mahle WT, Clancy RR, McGaurn SP, et al. Impact of prenatal diagnosis on survival and early neurologic morbidity in neonates with the hypoplastic left heart syndrome. Pediatrics. 2001;107(6):1277. Kipps AK, Feuille C, Azakie A, et al. Prenatal diagnosis of hypoplastic left heart syndrome in current era. Am J Cardiol. 2011;108(3):421-7. Monaco MA, Liberman L, Starc TJ, et al. Defining the electrocardiogram in the neonate with hypoplastic left heart syndrome. Pediatr Cardiol. 2015; 36(5):1014. Verheijen PM, Lisowski LA, Stoutenbeek P, et al. Prenatal diagnosis of congenital heart disease a ects preoperative acidosis in the newborn patient. J Thorac Cardiovasc Surg; 2001;121(4):798-803. Bull C. Current and potential impact of fetal diagnosis on prevalence and spectrum of serious congenital heart disease at term in the UK. British Pediatrics Cardiac Association. Lancet 1999;354(9186):1242-7. Simpson J M. Hypoplastic left heart syndrome. Ultrasound Obstet Gynecol. 2000;15:271-278. Bove EL. Current status of staged reconstruction for hypoplastic left heart syndrome. Pediatr Cardiol. 1998;19(4):308-15. Forbess JM, Cook N, Roth SJ, et al. Ten-year institutional experience with palliative surgery for hypoplastic left heart syndrome. Risk factors related to stage I mortality. Circulation; 1995;92(suppl):II2626. Ishino K, Stumper O, De Giovanni JJV, et al. The modified Norwood procedure for hypoplastic left heart syndrome: early to intermediate results of 120 patients with particular reference to aortic arch repair. J Thorac Cardiovasc Surg. 1999;117: 920-30. Karamlou T, Diggs BS, Ungerleider RM, et al. Evolution of treatment options and outcomes for hypoplastic left heart syndrome over an 18-year period. J Thorac Cardiovasc Surg. 2010; 139:119. Ohye RG, Sleeper LA, Mahony L, et al. Comparison of shunt types in the Norwood procedure for single-ventricle lesions. N Engl J Med. 2010;362:1980. Audrey Marshall. Hypoplastic left heart syndrome. Https://www.uptodate.com (accessed).25.04.2017. Hirsch JC, Copeland G, Donohue JE, et al. Population-based analysis of survival for hypoplastic left heart syndrome. J Pediatr. 2011;159:57. Cnota JF, Hangge PT, Wang Y, et al. Somatic growth trajectory in the fetus with hypoplastic left heart syndrome. Pediatr Res. 2013; 74:284. Forbess JM, Cook N, Roth SJ, et al. Ten-year institutional experience with palliative surgery for hypoplastic left heart syndrome. Risk factors related to stage I mortality. Circulation. 1995;1;92(9 Suppl):II262-6. Glauser TA, Rorke LB, Weinberg PM, et al. Acquired neuropathologic lesions associated with the hypoplastic left heart syndrome. Pediatrics 1990;85(6):991-1000. Li X, Robertson CM, Yu X, et al. Early postoperative systemic inflammatory response is an important determinant for adverse 2-year neurodevelopment-associated outcomes after the Norwood procedure. J Thorac Cardiovasc Surg. 2014;148(1):202-6. Rogers BT, Msall ME, Buck GM, et al. Neurodevelopmental outcome of infants with hypoplastic left heart syndrome. J Pediatr. 1995;126(3):496-8. Allan LD, Apfel HD, Printz BF. Outcome after prenatal diagnosis of the hypoplastic left heart syndrome. Heart. 1998;79:371–373. Kumar RK, Newburger JW, Gauvreau K, et al. Comparison of outcome when hypoplastic left heart syndrome and transposition of the great arteries are diagnosed prenatally versus when diagnosis of these two conditions is made only postnatally. Am J Cardiol. 1999; 83:1649–1653. Tworetzky W, Mc Elhinney DB, Reddy VM, et al. Improved surgical outcome after fetal diagnosis of hypoplastic left heart syndrome. Circulation. 2001;103(9):1269-73. Brackley KJ, Kilby MD, Wright JG, et al. Outcome after prenatal diagnosis of hypoplastic left- heart syndrome: a case series. Lancet.2000;356(9236):1143-7. Axt-Fliedner R, Enzensberger C, Fass N, et al. Fetal diagnosis of hypoplastic left heart, associations and outcomes in the current era. Ultraschall Med. 2012;33. Allison Levey, Julie S Glickstein, Charles S Kleinman, et al. The Impact of Prenatal Diagnosis of Complex Congenital Heart Disease on Neonatal Outcomes. Pediatr Cardiol. 2010;31(5): 587–597. Jaeggi ET, Sholler GF, Jones OD, et al. Comparative analysis of pattern, management and outcome of pre- versus postnatally diagnosed major congenital heart disease: a population-based study. Ultrasound Obstet Gynecol. 2001;17(5):380-5. Axt-Fliedner R, Enzensberger C, Fass N, et al. Fetal diagnosis of hypoplastic left heart, associations and outcomes in the current era. Ultraschall Med. 33. Daebritz SH, Nollert GD, Zurakowski D, et al. Results of Norwood stage I operation: comparison of hypoplastic left heart syndrome with other malformations. J Thorac Cardiovasc Surg. 200;119(2):358-67. Martin BJ, De Villiers Jonker I, Joffe AR, et al. Hypoplastic Left Heart Syndrome is not Associated with Worse Clinical or Neurodevelopmental Outcomes Than Other Cardiac Pathologies After the Norwood-Sano Operation. Pediatr Cardiol. 2017;1598-5.